Thank you, grocery shopping gods. Thank you for that one day that my roommate and I were at Whole Foods for something specific, but we decided to walk the aisles. Thank you for letting her turn her head at the right time and spot the most epic thing ever in the pasta aisle. Thank you…for La Pasta. And thank you, La Pasta, for your gorgeous Gluten-Free Spinach and Cheese Ravioli. In the past, my best gluten-free pastas have been of the fresh variety. I blogged about the amazing RP Pasta Company’s fresh gluten-free noodles awhile back. I have some fresh gluten-free gnocchi to try as well from Nuovo. That will be next. But…hands down, the best pastas are the ones that aren’t made to be frozen. Gluten-free pasta can be so finicky and can go from perfect to gummy to mushy within seconds. But, I wasn’t passing up the opportunity to try these out. So, after going out for gluten-free pizza with a co-worker one Friday night and getting the roomie completely toasted on a beer flight, it was time to go grocery shopping. (Note: Grocery shopping with a sorta drunk roommate is the best grocery shopping ever…because I can buy, literally, anything I want). We hit up Trader Joe’s first and behaved, sticking to the list. So…her sandwich bread and some of their potato chips for her lunch. Then…it was Whole Foods time. And I was prepared for my moment of gluten-free grocery shopping glory. Walk the aisles? You better believe it. Grab whatever I have been wanting to try? You betcha! I had almost forgotten about the pasta but it struck me just as we were about to head for the checkout line. Whew. Close call. 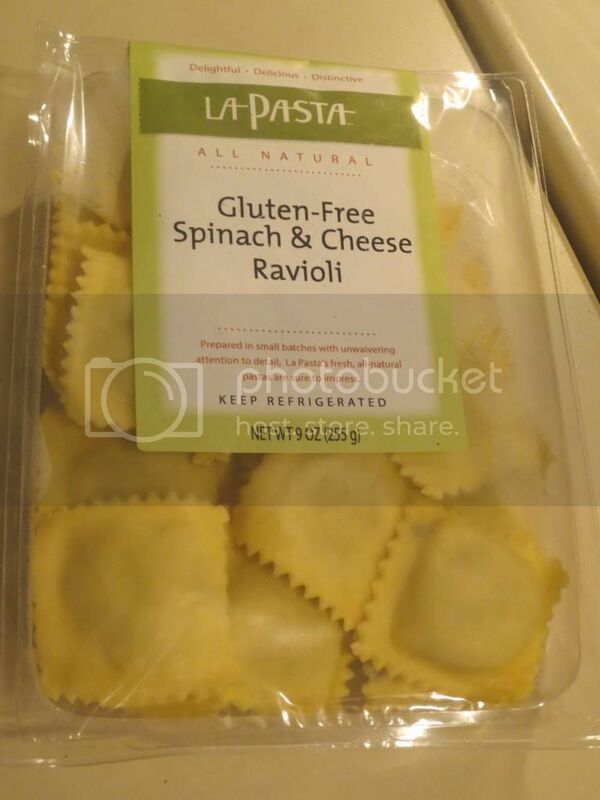 We scurried back to the pasta section and had to make the choice between La Pasta’s Gluten-Free Cheese Ravioli or La Pasta’s Gluten-Free Spinach and Cheese Ravioli. The tipsy wonder chose for me, snagging a package of the Gluten-Free Spinach and Cheese Ravioli. With no plans in the works for dinner tonight, I figured I could use up the rest of the pasta sauce in the fridge if I simply cooked up the package of ravioli for dinner. Perfect. And not very time consuming either. The part that took the longest was waiting on the 4 quarts of water to come to a boil. But, like any good chef, I just slapped a lid on the pot and it happened a lot faster than it would have otherwise. With the pasta sauce working on the stove, and the water now heated to a boil, I cut open the plastic packaging holding the little pockets of spinach and cheese wonder and poured them into the boiling water, immediately turning down the heat. It came up to a boil and the pasta cooked for about 2 – 3 minutes. BOOM. Done. That simple. I drained the pasta and shook out all the excess water. Then, it was already time to serve up dinner. I split the package between us, which worked out to about 12 ravioli each. These were very light and I could see the stuffing through the pasta after I cooked it up. And it smelled absolutely fantastic. The best part was, nothing was sticking together. 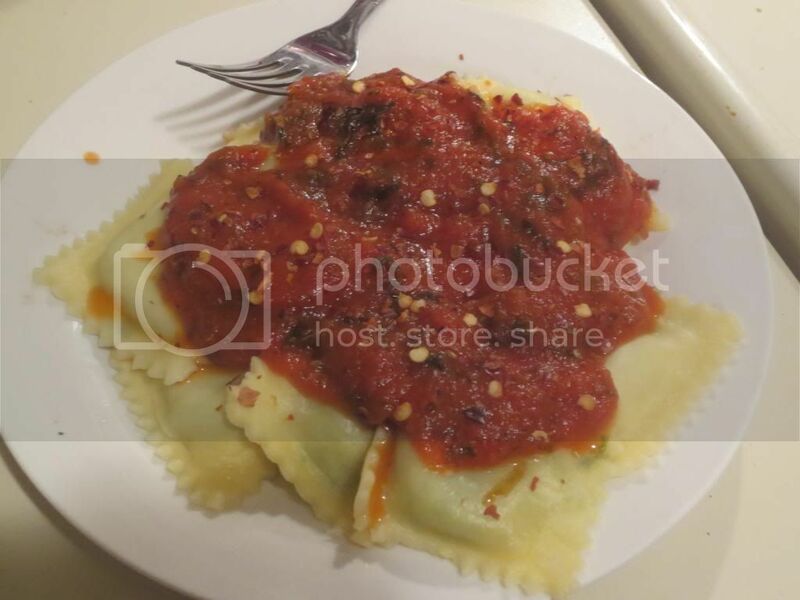 Each ravioli easily slid from the spoon I was dishing it up with onto the plate. No casualties of war. Not one. I was already impressed and just praying now that I had cooked them long enough. Hey, I cooked as instructed on the packaging…which sometimes works out…and sometimes does not. I sauced each plate with a serving of the marinara sauce (Classico’s Florentine Spinach and Cheese, for the record) and topped off my roomie’s with fresh Parmigiano Reggiano and hit up mine with some crushed red pepper. Yummy!! Dinner was served. Moment of truth. One swipe of the fork and I knew I was in for a treat. The pasta was perfection. It cooked up soft, without turning to mush or becoming gummy and sticky. The little pockets of ravioli held the stuffing, the fresh spinach and ricotta cheese, perfectly. And when I took my first full bite, everything just melted together and made the most perfect bite of ravioli I have ever experience since going gluten-free. It was full of flavor, cooked to perfection, and just made for a perfect bite. I was hooked…and sort of wishing I had more of it on my plate. So, let’s talk nutrition. 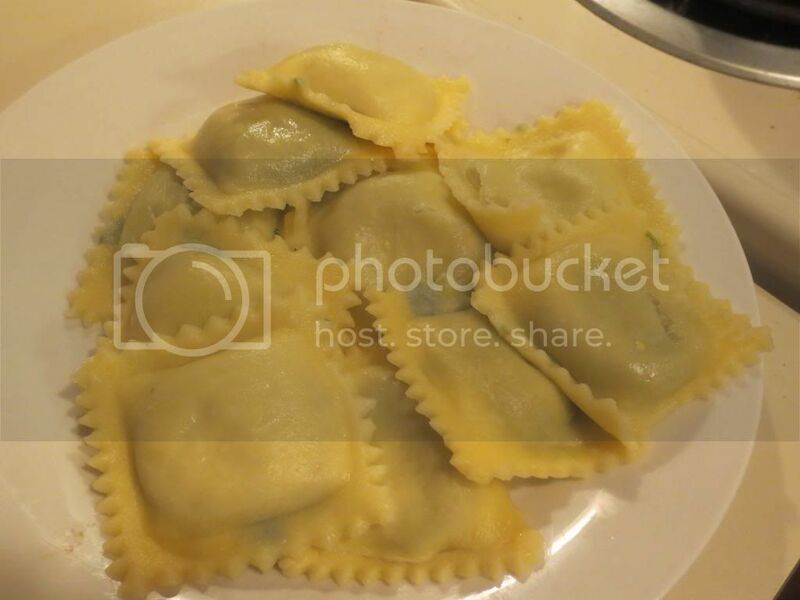 A serving of La Pasta Gluten-Free Spinach and Cheese Ravioli is 95 grams. There are 2.5 servings per container. My roommate and I split the entire package. An actual serving of this ravioli will serve up 170 calories and 5 grams of fat. A serving also contains 40 mg of cholesterol and 480 mg sodium. As far as fiber goes, the Gluten-Free Spinach and Cheese Ravioli only offers 1 gram of fiber, but you do get a healthy dose of 7 grams of protein. Loving it. And as for the ingredient list, it doesn’t get much simpler than a filling made from ricotta cheese, spinach, Parmesan cheese, mozzarella cheese, sea salt, canola oil, olive oil, black pepper, garlic, potato flakes, and nutmeg. As for the pasta itself…that’s a blend of corn starch, whole dried eggs, potato starch, sea salt, tapioca starch, filtered water and xanthan gum. Yep. It’s really that simple. And it tastes like homemade. That’s the very best part. Tender with a cheesy center that just melts…it melts. It’s awesome. La Pasta…you’ve won my heart…and my gluten-free pasta loving soul. This entry was posted in Cheese, Food, Gluten-Free, Italian, Pasta, Products, Review, Sauce, Vegetables, Vegetarian by The Celiathlete. Bookmark the permalink.